As I mentioned earlier, I browsed through some blog sites to learn from those gurus and senior bloggers, one thing came to my mind, how "good" or "bad" jacko.my is. Since it has been quite some time ago I sat for an exam, I think it may be good for me to go through a grade exam to get myself a "report card". You do nothing but only type in your blog url and click Generate Report. Initially I thought this site was another crappy site, you'd know, those sites say free on the first page, and ask you for $$ when you want to view the report. But no harm trying, right? So did I pass the exam? Frankly, I don't know by looking at the summary. I don't know if there are 4,978,471 blogs out there and I rank... err... last??!! 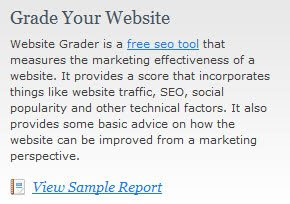 Website Grade of 15 in the rank sounds not bad right? But what do you think if it's 15 out of 100??!! Simple lah! It means I failed the exam!! As simple as ABC! Haha! But heck, jacko.my is new right? just only 2 months old, so what could you expect from a newly born baby? At least the posts were kinda interesting right? Also, I was contacted by few unknown readers from US, from Normay, from Germany etc who found my Wind posts were useful to them! And the world is small, one of my friends found my blog from google, and did not know it was my site till he saw my macho profile photo. Haha! So, I am optimistic, rooms to improve, way to come... :) You can do the same exam if you also host a site.